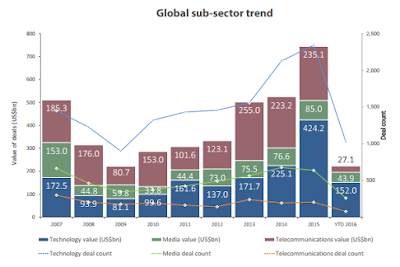 The Technology, Media and Telecommunications (TMT) sector has experienced a re-balancing compared to the record M&A activity seen in 2015, according to the latest global market study by Mergermarket. During the first half (H1) of 2016, 1,363 deals worth $223.1 billion represented a 41.6 percent decrease in value compared to H1 2015 ($382.3 billion, 1,580 deals), and the weakest H1 deal value and count since 2013 ($173.5 billion, 1,056 deals). Reflecting this low activity, no mega-deals (< $10 billion) took place within the Technology, Media and Telecommunications sector during H1 2016, compared to a record nine during the same period in 2015, with the highest recorded deal of H1 -- Chinese Internet giant Tencent Holding's acquisition of Finland's online gaming editor Supercell -- valued at $8.6 billion. Following a succession of high valued deals seen over the past few years, Telecommunications M&A seems to be feeling the effects of an increasingly saturated market. According to the Mergermarket assessment, the sub-sector saw just 78 deals worth $27.1 billion during H1 2016, plummeting 82.4 percent by value compared to H1 2015 ($154.1 billion, 100 deals), to reach the lowest half-year deal value since H1 2009 ($26.9 billion, 77 deals). Moreover, many Technology companies are at the beginning of their innovation life cycle, and as a consequence less mature businesses are coming to market commanding smaller price tags. M&A targeting Technology during H1 ($152.0 billion, 1,025 deals) highlights this trend, recording a 25.9 percent value decrease compared to H1 2015 ($205.2 billion, 1,172 deals), while accounting for 147 fewer deals. Europe suffered the largest regional fall in Technology M&A activity, with 305 deals worth $24 billion marking a 44.3 percent drop in value compared to H1 2015 (355 deals, $43 billion). Furthermore, the run-up to the Brexit referendum slowed UK Technology M&A, with 75 deals worth $3.1 billion announced in the first half of the year representing a 57.5 percent decrease by value compared to H1 2015 (74 deals, $ 7.4 billion), and its third consecutive quarterly decline in deal value.